I will always let you know. Your home is diligently childproofed from the electrical outlet covers to the toilet lid lock, but what happens when you take your child(ren) on a vacation and you’re in a hotel? You want to relax on your vacation, not worry, and that’s what the creators of the Travel Childproofing Kit had in mind when they came up with this great idea. 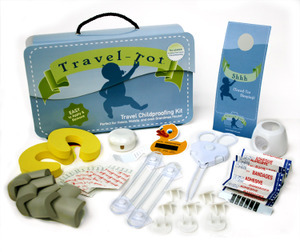 The Travel-Tot Travel Childproofing Kit provides an easy, temporary, non-damaging way to childproof hotel rooms by using non-damaging adhesive strip fasteners. No tools are required to install any of the components, and the whole product fits into a neat portable carrying case. Check out the website for more info and to order. Keep your little explorer safe when you travel. I love this idea. I always end up worrying what my toddler will get into instead of relaxing. Thanks for the tip. I hope one day to be able to take my family to Europe. It would be so awesome. So far, we've only been around our little province. Your blog is fascinating!